Bridgeport‚ CT -- Gathering of the Vibes‚ the Northeast's premier summer music festival‚ announces initial lineup including: FURTHUR featuring Phil Lesh and Bob Weir‚ Jane's Addiction‚ Elvis Costello & The Imposters‚ moe.‚ The Levon Helm Band‚ John Butler Trio‚ Tedeschi Trucks Band‚ Dr. John and the Lower 911‚ Taj Mahal Trio‚ The Rhythm Devils with Keller Williams‚ Steve Kimock and Reed Mathis‚ Ivan Neville's Dumpstaphunk‚ Toots & The Maytals‚ Dark Star Orchestra‚ Ryan Montbleau Band‚ David Gans‚ Assembly of Dust‚ The McLovins‚ King for a Day and Bridgeport's own Deep Banana Blackout. The New Mastersounds‚ Big Gigantic‚ and others to headline the Late Night Stage. The second round of artist announcements will be made within the next 2 weeks. Vibes continues its tradition of embracing new‚ undiscovered artists‚ alongside legendary performers by reviewing 2‚400 submissions via the Vibes website and Sonicbids‚ for an opportunity to perform in front of 20‚000+ music enthusiasts. Over 40 bands will perform on multiple alternating stages at Seaside Park's 370-acre beachfront venue. "Gathering of the Vibes continues its musical evolution and remains true to our roots with this year's lineup‚" says festival founder Ken Hays. The Vibes is an all ages‚ family friendly event‚ offering an exclusive Family Camping area‚ Kids Corner‚ and a Teen Scene that includes interactive workshops and a "Teen Vibes Stage" offering musical instruction and jam sessions with main stage artists. For the first time‚ Vibes is offering single day VIP tickets. VIP Vibesters can look forward to rock-star parking‚ a stage-side chill tent‚ catered meals‚ snacks and beverages. All tickets and camping passes are on sale and available now at: www.gatheringofthevibes.com. Fans traveling to and from New York can ride the Metro North‚ Port Jefferson Ferry or return on the late night "Vibes Party Bus" with shuttle service to Penn Station‚ Grand Central Station and NY Port Authority‚ post Friday and Saturday night sets‚ departing at 3:30 a.m. Hotel packages with complimentary shuttle bus service are available at: www.gatheringofthevibes.com/hotels. For over a decade and a half‚ Gathering of the Vibes has been a frontrunner in creating an online community whose year round support is dedicated to helping make the world a better place through charitable causes and environmental initiatives. Vibes 2011 is dedicated to the memory of Michael J. Potashnick‚ the "Voice of the Vibes‚"
co-Emcee since 2005‚ and a cherished member of the Vibes family since its inception. 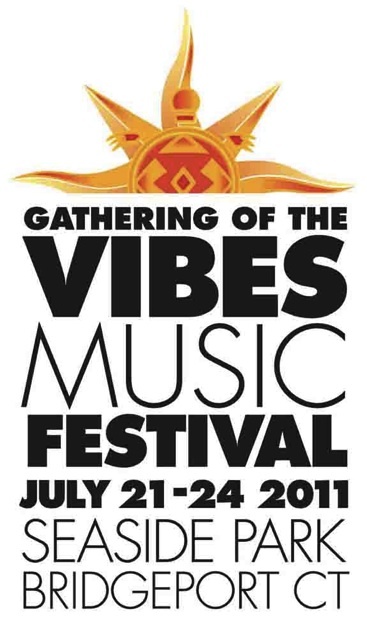 Follow Gathering of the Vibes on Facebook‚ Twitter‚ and Myspace‚ or check the message boards for the most updated festival information.